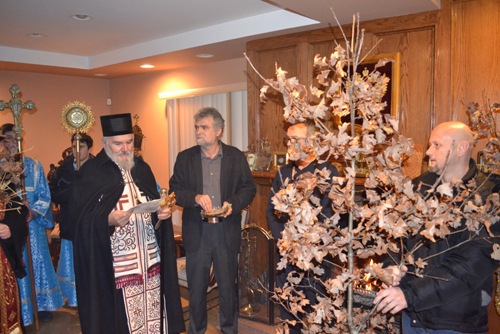 Milton, Ontario - A solemn Vesper service was served on the eve of the feast, with the placing of the Badnjak, officiated by His Grace Bishop Georgije of Canada, with the concelebration of V. Rev. Stavrophor Zivorad Subotic, Protosindjel Vasilije (Gavrilovic) and Protodeacon Stefan Ikonomovsky. 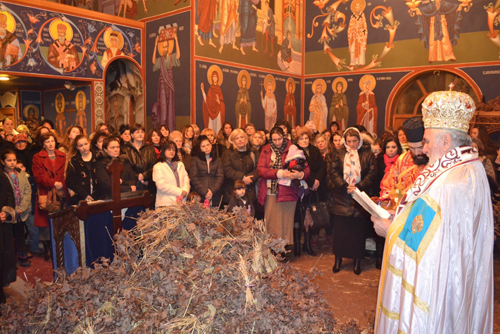 Many were gathered in church from surrounding areas: Toronto, Hamilton and Kitchener, taking part in the service and blessing of the Badnjak. 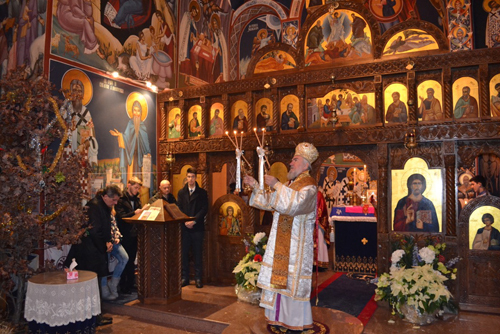 After the service His Grace read the Nativity Encyclical of His Holiness Serbian Patriarch Irinej. The Badnjak was brought in with song to the monastary living quarters where the faithful were served a lenten dinner and hot, cooked rakija, prepared by the hard working monastery Kolo Sestara. 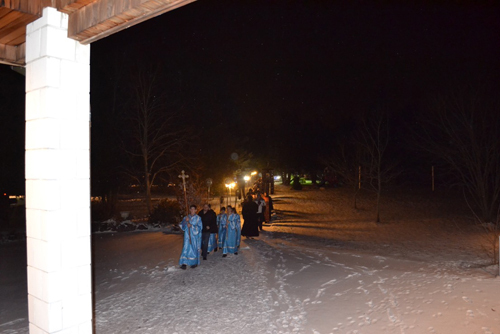 In the early and cold morning hours, at exactly four in the morning, the bells rang and the solemn Christmas Liturgy began. 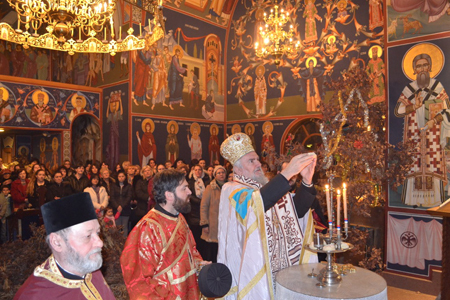 The holy Hierarchical Liturgy was officiated by Bishop Georgije, with the concelebration of Prota Zivorad Subotic, Protosindjel Vasilije and Protodeacon Stefan. Many were in attendance just as the night before in celebration the birth of Christ the Savior. Many of the faithful people of God, after the preparatory fast and prayer, approached the Holy Chalice and partook of the Holy Mysteries. Bishop Georgije, after the dismissal, addressed the faithful with the Encyclical, greeting and congratulating everyone on the feast of the Christ Child, greeting them with the most joyous greeting: God's Peace! Christ is Born! Indeed He is Born! Afterward the bishop invited everyone to take part in the traditional Christmas meal prepared by the hard working members of the Monastery Kolo. The bishop, after the Christmas tropar and blessing the food, gave to everyone a piece of the cesnica, greeting them with the Christmas greeting. With Christmas songs and discussion the most joyous feast of Christ's Nativity was celebrated this year as well.